I use Evernote a lot. I have about 100 Notebooks and close to 6,000 notes, so it can get a little overwhelming at times. I use tags and Evernote's search is great and the related notes feature helps find other info, but I just learned about a new service, made for Evernote, that turns your Evernote notes and notebooks into a mind map. It's called MohioMap. 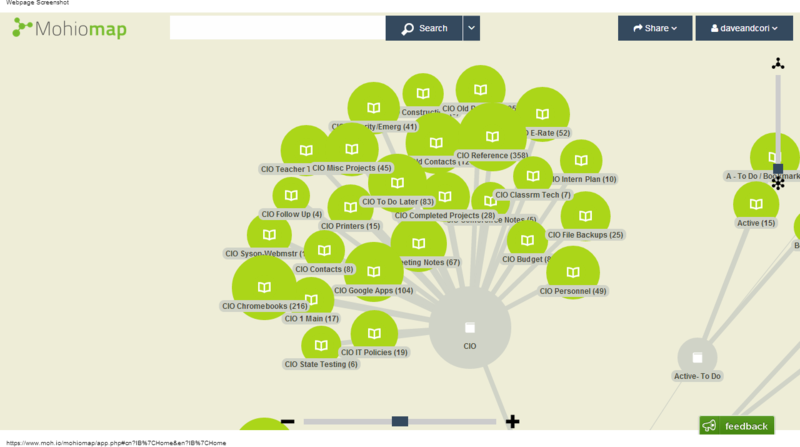 MohioMap takes all of your Evernote notes and data and creates a visual map. It makes it easy to navigate and see connections. The center is your account and then it branches out by notebooks and notes. You can view the notes in Mohiomap or open in a new window or in Evernote itself. You can pin nodes on the map and view by relevance to points you click on and you can even drag and drop tags from one node to another, making it easy to connect notes by tags. It adds another layer of functionality to Evernote. Go to the site, create a free account, confirm your account and provide MohioMap with access to your Evernote account and you are all set.